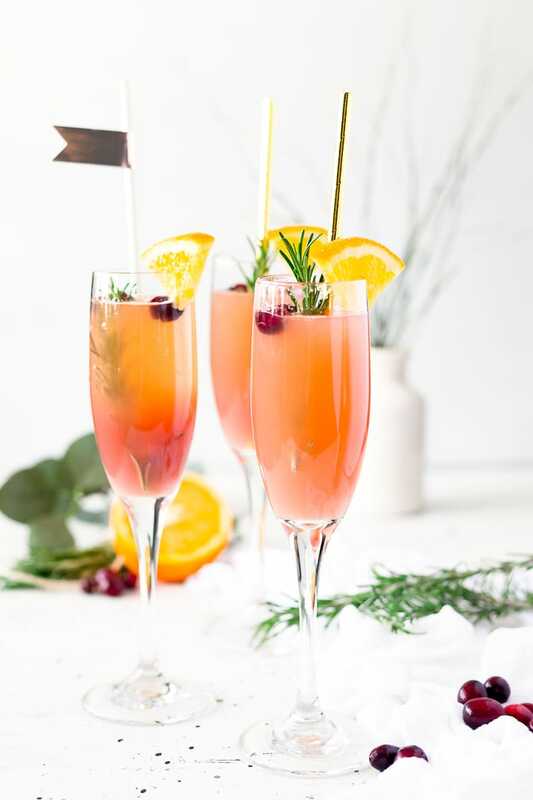 This Cranberry Orange Mimosa is the perfect cocktail for winter brunch! 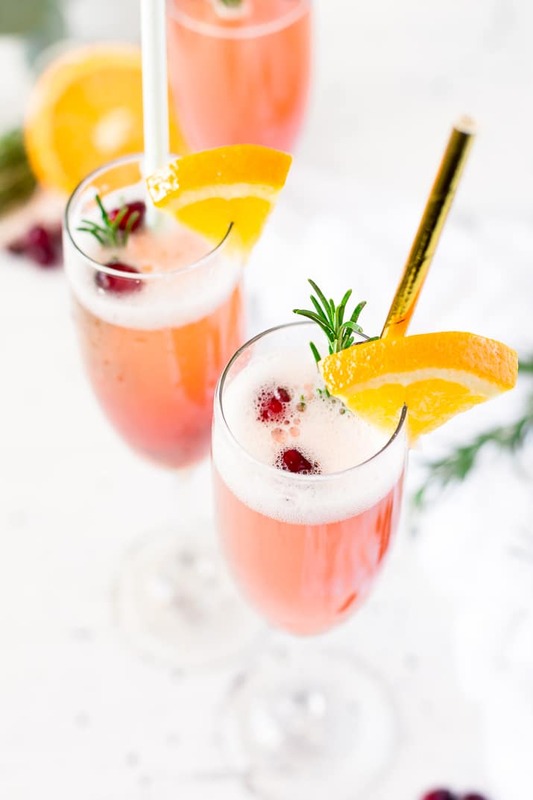 Made with cranberry and orange juice and champagne it’s a fruity drink that you can serve up for Christmas or New Year’s Eve or any other weekend celebration! Happy Friday, friends! I got home from Europe earlier this week and I’m so excited to be home for the holidays! I spent the last 4 days of my trip in Paris with my husband and it was a mix of magical and miserable, but hey, I’d like to think all the delicious food and drinks made up for the bad! Because how bad can things really be when you’re in the city that brought us the Mimosa, eh? So you want to hear a bit about our trip? Well, the first couple of days were really great, it was nice to have some travel time with just my husband since I’d been gone a lot the last two months without him. On the third night, we decided to walk the 3 miles from Trocadero to our Airbnb. Dusk was settling in and the light on the streets was pretty, and I’m a firm believer that there’s nothing better to do in Paris than to stroll around and eat things with the one you love. Well anyways, 20 minutes into our walk back, the rain started up something fierce and the wind came with it. Our stupid umbrella broke and there may or may not have been a moment where I bashed the thing into the ground out of frustration. About the time our umbrella broke was when we got to the roundabout near the La Grande Roue, where there were no buildings to take cover in. Cute. It was time to call an Uber, well, about 5 minutes earlier, the day on my Skyroam Hotspot Device ran out, and of course, it was my last day and I couldn’t purchase more without wifi. Extra cute. So we walked the last two miles back to our Airbnb in pouring rain that was coming in sideways. It sucked. But we kept my camera and the macarons safe 😉 Our jackets, hats, and gloves were soaked through, Matt’s shoes were done for, my boots had started to leak, and we were freezing. And of course, I had booked an Airbnb with a washer and dryer and the dryer had broken the week before we arrived, so we could only air dry them. And Matt twisted his ankle. So we basically spent the rest of the trip without jackets, walking the streets of Paris. As a result, I’m pretty sure people thought we were either Nordic or crazy. And I probably should have bought some champagne and juice and just nursed a mimosa for the rest of the trip to make it better. So anyway, more on my trip in future posts, let’s get back to the really good stuff, this mimosa recipe! This is the time of year when I crave all things cranberry. It’s probably my favorite holiday flavor, although I do love my eggnog! And cranberry and orange is the perfect festive combo for everything from meatballs to cocktails! A cocktail made with equal parts chilled fruit juice and chilled champagne. Traditionally, it is made with just orange juice and is stirred, not shaken and served in a champagne flute. Where did the Mimosa originate? It’s believed to have first been made in the Hotel Ritz in Paris back in the 1920s by Frank Meier. Can I Make a Mimosa Non-Alcoholic? Champagne is a key ingredient in this drink, but if you want to make something similar without alcohol, try using sparkling white grape juice. It was believed to have been first made with a traditional Brut champagne, but you could also use other sparkling wines like Prosecco or Cava as well. How many can you make out of a bottle of Champagne? With equal parts juice, you can usually get 12 to 16 drinks per bottles. I think the key to a good mimosa or making any cocktail taste great, really, is using fresh fruit juice whenever possible. And while you won’t find me pressing cranberries (I’m not that ambitious), I find that when you use fresh squeezed orange juice and add a splash of lemon juice, it can really add a lot to a drink in my opinion. 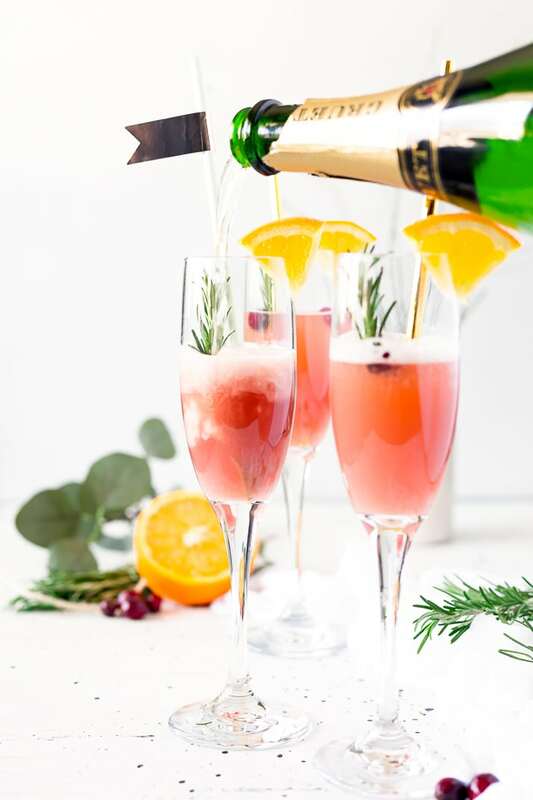 So I hope you’ll mix up this Cranberry Orange Mimosa recipe for your holiday get-togethers this year, share them with friends and enjoy all kinds of holiday cheer with this bubbly and fruity cocktail in hand! 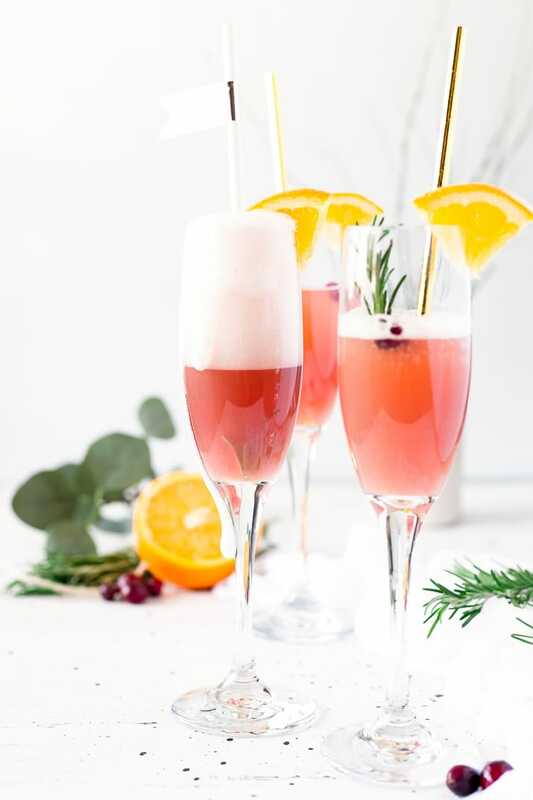 This Cranberry Orange Mimosa is the perfect cocktail for winter brunch! 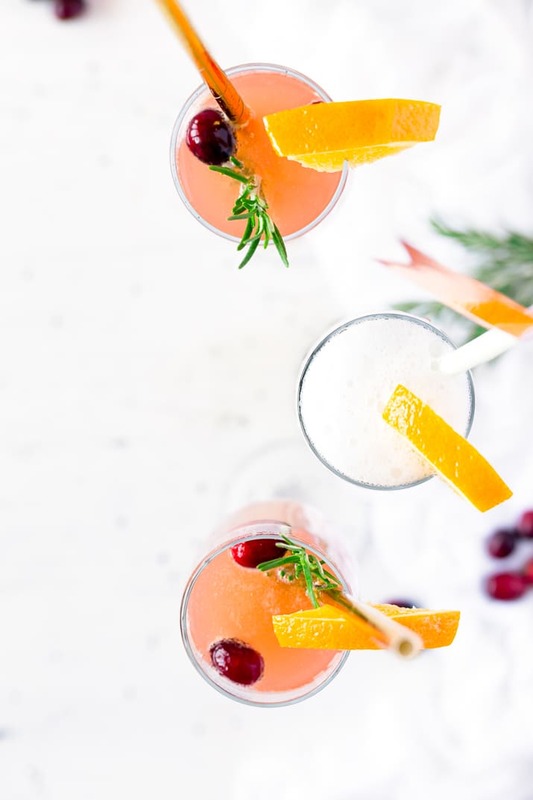 Made with cranberry and orange juice and champagne it's a fruity drink that you can serve up for Christmas or New Year's Eve or any other weekend celebration! 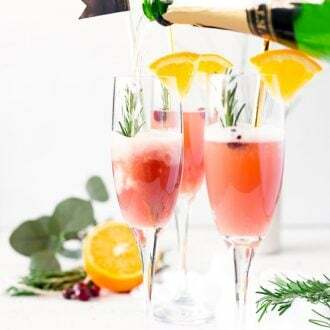 In a champagne flute, layer the juice with the cranberry juice first, followed by the orange juice, then top with the champagne and a quick squeeze of lemon juice. Garnish with fresh rosemary, cranberries, and orange slices. Looks perfectly festive and I would love one (or a few) this holiday season! I’m pretty sure everyone has a Paris walking story of mishaps – at least it all happened in Paris! Travel mishaps definitely happen to everyone! I hope you get a chance to try this recipe soon! Yumm! This really looks amazing. Happy New Year!